This AFL is dedicated to Mr Illango ( Author of Just Nifty ) and its followers. The AFL presented here is the modified version of 35 Bar Stochastics. And some custom changes to eliminate noise. And the Static stop loss is 3-Bar Low for Buy conditions and 3-Bar high for Sell Conditions. Discipline should be maintained when the 3Bar Low or High lines breaks during your trade. And it is advised to take trade decisions based on only one time frame at any point of time. sir how can use this link in my ambibroker????????? Can these code be useful for MT4 Platform or sir, can you provide MT4 code…? Will soon start coding the same indicator for MT4 too. How can i do this in Motivewave software? Thks Raj. Is it possible to code this on excel since many would not be using ami or metastock platforms. Thks again. Really thanks for the AFL…. Can you do some modifications… like it gives two three buy and /or sell signals in a row. Its a early version. Still looking into the possibilities of fixing the noise in the system. Thanks for the AFL… but can you fix the continuous two three buy or sell signals. 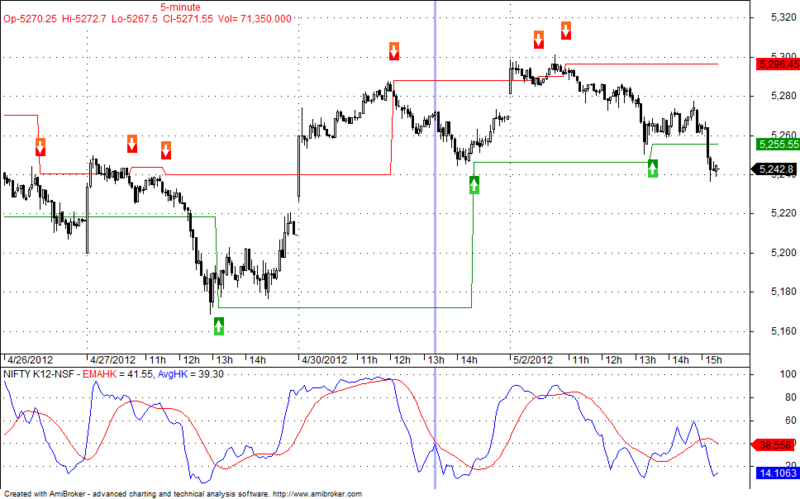 If the stoploss doesnt hits then two-three buy or sell signals can be taken as one signal. But still removing excessive signals is not possible as it is designed in that way. Probably .. if EXRIM function is used… then will it remove excessive Signals? Though I am not Tech Expert… I have read it somewhere.. Yes Exrem removes excessive signals. But here it not the usual case.. EXREM cant be used here logically. This is good that u create Amibroker AFL code Modified Illango Strategy .. i am using it .. can u draw Hr. KST Indicator and Day KST indicator AFL code from IIlango Excel File … if tht done it will be helpful to me .. I am ardent follower of illango Sir blog and very much appreciate your idea to dedicate Amibroker AFL code in his name. My sincere request to you is to add a chart in your blog by name “JNSAR” for Nifty Spot which will help lot of sir followers to confirm their trade with your chart. Do you have same for MT4 ? Nope one have to code it. Can we backteast this strategy with Amibroker? Can you please put backtest results by using strategy.